આ વેબ પેજ ગુજરાતીમાં વાંચવા માટે અહિયાં ક્લિક કરો. This page shows you how to type vowels and vowel signs using Gujarati Unicode fonts. Vowels are independent characters (can be typed by themselves) and make a sound themselves. Vowel signs are not independent and cannot be typed by themselves. They need another character preceding them. If typed independently, you will see a dotted circle that is the placeholder of a consonant or conjuncts. Below are the vowels and vowel signs. Notice the placeholder circle for the vowel signs. Note: Microsoft Word will not allow you to type vowel signs independently without a preceding consonant or conjuncts. In other applications, such as Notepad and other text editors, you can type them independently and you'll see the dotted circle placeholder. Browsers will also show the dotted circle placeholder when vowel signs are used independently in the HTML code as shown above. Since each vowel is a consonant of its own, you cannot combine a vowel and a vowel sign. For example, to type ઓ, you simply type 'O' on the Gujarati Phonetic keyboard layout. You do not type અ + ો. Typing this combination simply gives અ‌ ો, where the vowel sign ો is not combined with અ. However, typing પ + ો gives પો; where this time they are combined. The order in which consonants and vowel signs are type is important. All vowels signs are typed after the consonant, no matter if the vowel sign appears prior to the consonant. For example, ભ + ક + ્ + ત + િ = ભક્તિ. Notice that although the vowel sign is typed last, it is automatically place prior to the conjunct ક્ત. The anusvara is mapped as the greater than (>) key as shown in the image below. The visarga is the vowel sign that looks like a colon. However, it actually requires a preceding consonant. Words such as અંતઃકરણ (antahkaran) require the visarga, not a colon. 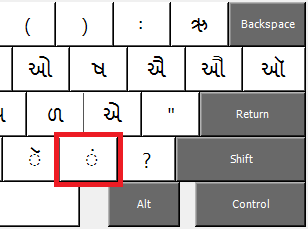 You can incorrectly type such words with a colon by switching the input language to English and typing the colon (or typing Ctrl+Alt+/ using the Gujarati Phonetic keyboard). However, you should use the visarga for correct Gujarati. See example below for incorrect and correct. A closer examination shows that the colon looks different compared to the visarga. 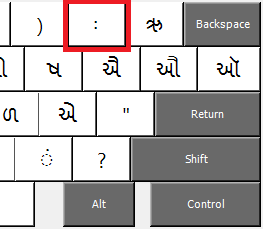 The visarga is mapped as the underscore (_) key as shown in the image below and the colon is Ctrl+Alt+/. Note: When vowel signs are combined with consonants or conjuncts, the result becomes a single combined entity. If you move around this entity with the arrow keys, the cursor will move past the whole entity and not the individual components. Some text editors, such as Notepad2 and Notepad++, you will be able to move in between the components. Example: તઃ is considered a single entity when typed correctly with the visarga. Similarly, in વિદુઃ, દુઃ is a single entity. વીન્ડોઝમાં ગુજરાતી ભાશા આધાર સ્થાપીત કેવી રીતે કરવો ?